Reading Nicholas Lehman's portrait of Romney's Mormon business-power world in the New Yorker (did you know the Mormons as a group went to Mexico so they could practice polygamy unimpeded?). Quietly chilling the power of these Mormons and how they use their connections: they feel persecuted; they are intensely devoted businessmen -- to their profit and aggrandizing themselves and thus their friends. Not mentioned below too is another reason for voting for Obama: One I've never mentioned before. If you should have what would be a small amount (to Romney & the 1%) of money invested or saved, it's in danger of being wiped out if you vote for Romney. He couldn't care less about the 99%; all his concerns are him and his friends. They brought us 2008 where millions of people lost a lot of money for them. Obama is cautious, thoughtful, acts only after consultation, genuinely regards himself as representing a huge swath of the US. To vote for Romney is not just to vote for endless war, but to risk your life savings and investments as a small person. One reason to vote for Obama is long-term: remember how the supreme court is destroying our rights as citizens in the way they are manipulating the constitution on behalf of corporations. Corporations are people when it comes to using their money to fill the airwaves and hire police to control the increasingly smaller or non-existent public space. The result the opposite of what the first amendment intended: How the right packed the court. They pass readings which destroy unions - have gutted all the 1930s legislation which enabled unions to help people win decent lives: Isolating American Workers. And Romney will add to this group and set the course of history for the next 40 years to turn the US into a sacrifice area for all but the 1%. I feel impelled to end this blog in the a-picture-is-worth-a-thousand words category. 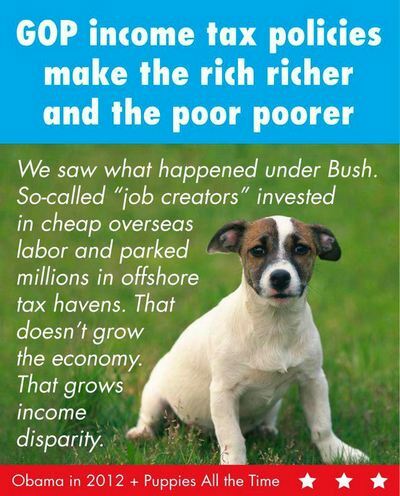 To the pictures: Romney attributes his own ploys and behaviors to Obama; second the real job destroyers. "And to lose your Social Security and Medicare and Medicaid, too!" Christina P.